Have you ever seen a quokka? Are they dying out on Rottnest? Whenever I stay at Rottnest I usually see quite a few. We used to stay in a tent at the camping ground and in the evenings the nearby oval and its surrounds would be covered with them. Even during the day there are usually a few semi-tame ones loitering around the settlement area. What a lot of people don't realise is that they're also found in a few parts of the south-west. When my family and Í have been camping at Windy Harbour (south of Northcliffe) and the Shannon National Park (on the way to Walpole) there are signboards mentioning that there are small colonies living there. However, they're a lot more shy than those on Rottnest Island. how interesting -I didnt know this! I used to see them a lot when I first came to WA -not telling when that was however! The last time I went which was probably about 10 years ago, I didnt see any. I used to hate them when we went camping a few times, as they were always in our tents pinching food if we left at night. Haha, that's happened to me too, Finy. One time my daughter and I went camping on Rottnest Island and left our tent flap slightly open while we slept. We woke in the middle of the night with a couple of quokkas scuttling around the tent (and on us), looking for things to eat. It was hilarious but a bit frustrating trying to get them out again. yes, same happened to us many years ago -I was however frighteened by them! 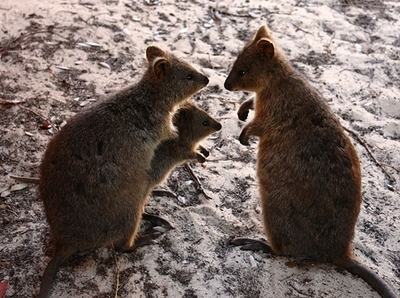 Enjoyed seeing them on Rottnest almost 40 years ago, but don't know how they have fared since. They are cute little creatures and certainly should be protected. I can remember some controversy when one was used as a football by some louts. I think it now has become a standing joke amongst visitors who would not dare put it into practice. No, but I have seen them on posters and other things. I guess I don't get out much! Where can you get the best sweet or savoury pies in Perth? Have you ever picked strawberries or other berries? Where is a good place for learner drivers to learn to drive?